Your ticket price includes access to the camping fields. You can choose to pitch your tent anywhere within the designated camping zones that sit throughout the Festival, from fields right next to the Pyramid Stage to more tranquil areas on the outskirts of the Festival. Different areas have different atmospheres. For example, Pennard Hill Ground, between The Park and The Healing Fields, is a popular, lively spot. It has a culture of its own with people returning year on year. Alternatively, camping zones on the periphery of the Festival, such as Limekilns and Hitchin Hill Ground, tend to be quieter. Some camping fields are very busy and fill up quickly but there is usually more camping space to the west of the site near the Park. Camping areas are marked out on the site map which you can find on the Information front page. 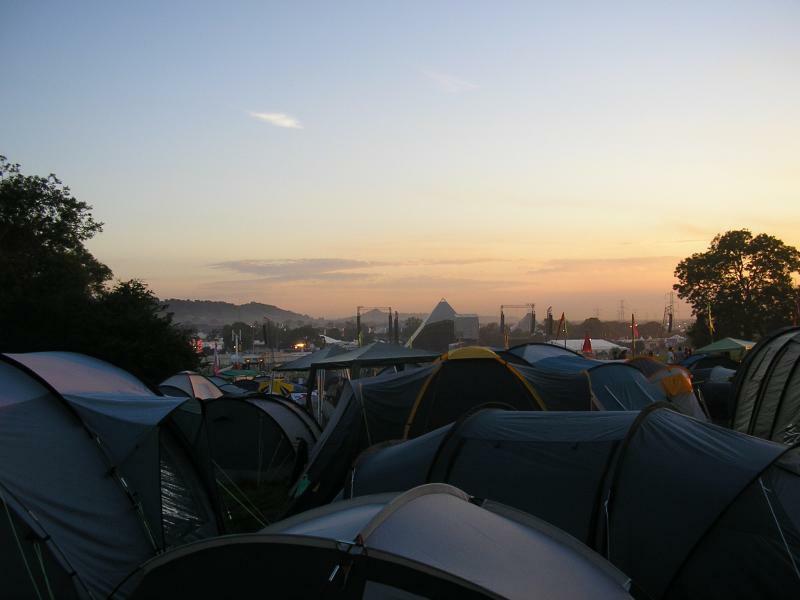 Although the capacity of Glastonbury Festival remained the same as previous years’ a substantial new area of extra camping space was brought in for 2011’s Festival. The extra space is close to the west car parks, just over the concrete road and a very short walk to the main site and entertainment areas. There was also a new Family Camping area, on the north-west of the site at Wicket Ground – again, you can see that on the Information front page. – BBQs can cause carbon monoxide poisoning when left in your tent. Never put them in an enclosed space, even after they appear to have gone out. For more info click here. – Campsite stewards have a base in every camping field. Check out where the nearest one is to you. They can direct and advise you, and are first port of call in an emergency – be it a medical or security issue. – It is worth noting where you camp in relation to a numbered Fire Point or other fixed point, or clearly marking your pitch with a flag. It can be a nightmare to find your tent without a recognisable landmark. – Please do not take up too much space when setting up camp. And please, please do not bring a gazebo. They needlessly take up valuable camping space (and there are plenty of more interesting places to sit at the Festival than just outside your tent). – Say hello to your neighbours to build a community feeling and provide greater security. Look after each other and if someone is feeling ill, get help. – Remember that tents are very vulnerable, even zipped up. Padlocks scream “I have something worth nicking in here”. – If you’re worried about something being stolen, don’t leave it in your tent. Essential valuables can be left at the free 24-hour Property Lock-ups which are prominent around the site. They also provide free loo rolls and soap. They are marked on Festival maps with the keyhole logo. – Postcode your valuables. UV pens are available at Property Lock-ups. – Bear in mind that the most commonly lost items in the camping fields are keys, wallets, phones and cameras. Please keep them safe! – Be inventive about hiding your money – and don’t keep it all in one place. – Love the farm – please do not leave any kit behind when you leave the farm. There are two Family Camping Fields: the Cockmill Meadow near the Kidz Field and another on the north-west of the site at Wicket Ground. Families do not need a special ticket to camp in the Family fields, but it is not possible to reserve space in advance (and they can fill up quickly). Anyone heading for the family campsite by the Acoustic field should take the Purple Route into the Festival. The disabled campsite for those registered disabled is located in Spring Ground, on the west side of the site. For full information on disabled facilities at the Festival click here.